Tribes Overall: "It exceeded our expectations on every aspect. 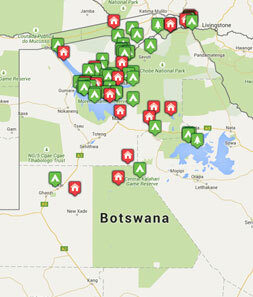 We loved Botswana and Victoria Falls. A truly magical destination, fascinating landscape and for us, good bird watching. We counted (anoraks that we are) 102 different bird species with a lot of help from our guides and fellow travellers." Tribes Service: "Tracy was great - knowledgeable, full of suggestions and as enthusiastic about our itinerary as we were! It was reassuring to sit back and have Tracy bring all our ideas together into one comprehensive trip"
Guides: "L.T. At PomPom was a particular favourite guide of ours - he is professional, experienced but with a good sense of humour and patience - he tracked lions that had come through the camp, until we found the male lions in the bush. Magical." Social & Environmental Responsibility: "We did not see any litter anywhere. Everyone demonstrates great care and concern about the environment and we felt they valued us as visitors and wanted us to have a great experience. They clearly love Botswana"
"Mokoro. Flight over the delta. Tracking the lions. Salt pan. Good food and wine"